A 90 Day Challenge to kick your year off to a great yoga start. The Challenge starts January 2 and ends March 31, 2019. 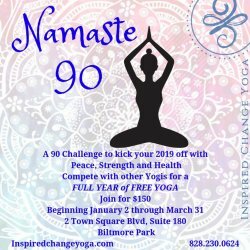 This package includes 90 days of Unlimited Yoga. Record your classes and compete with fellow Yogis for a Free Year of Unlimited Yoga!